As August, and consequently summer, sadly comes to a close, the Meridian Center for Cultural Diplomacy is back to round up some of this past month’s soft power events. The following selection highlights cultural exchange through community engagement in the globalized world. For the summer season, this interconnectedness means lots of festivals, so read on to see how diverse communities are coming together to celebrate around the world. 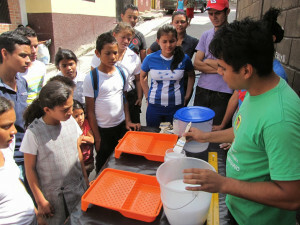 Honduran artist Walter teaches local youth how to prime the mural wall in 21 de Febrero, Tegucigalpa. In 2013, Meridian partnered with the U.S. Department of State’s Bureau of Educational and Cultural Affairs (ECA) to send mural artists abroad for the Community Engagement through the Mural Arts exchange program. While away, these artists were able to collaborate with local groups and artists in various community- based mural arts projects. Their goal: to create tangible pieces of artwork, while simultaneously fostering community engagement with the various populations of each country.